Occupied Jerusalem - The Gaza border region was quiet but tense on Tuesday morning after a night of heavy fire as Israeli occupation regime aircraft bombed targets across the Gaza Strip and Gaza fighters fired rockets into Israel in what threatened to escalate into a major conflict, just two weeks before the Israeli election. Schools in southern Israel were cancelled for the day and the occupation regime’s military massed forces on the Gaza border and imposed restrictions on civilian public gatherings, after dozens of rockets were fired toward communities in the area, including one that struck a house in the town of Sderot. The regime’s air force pounded alleged Hamas sites and those belonging to the smaller Islamic Jihad group. The targets included a multistory building in Gaza City that the Israeli regime said had served as a Hamas military intelligence headquarters and the office of Hamas leader Esmail Haniyeh. Gaza’s Health Ministry said seven Palestinians were wounded in the air strikes. Netanyahu has come under heavy criticism from both allies and opponents for what they say has been an ineffective policy of containing Gaza fighters. After a meeting with President Donald Trump and before leaving Washington, Netanyahu indicated the election would not deter him from acting. “We have responded very, very forcefully. Hamas needs to know that we will not hesitate to go in and take all necessary steps - regardless of anything, any date, other than Israel’s security needs,” he said. 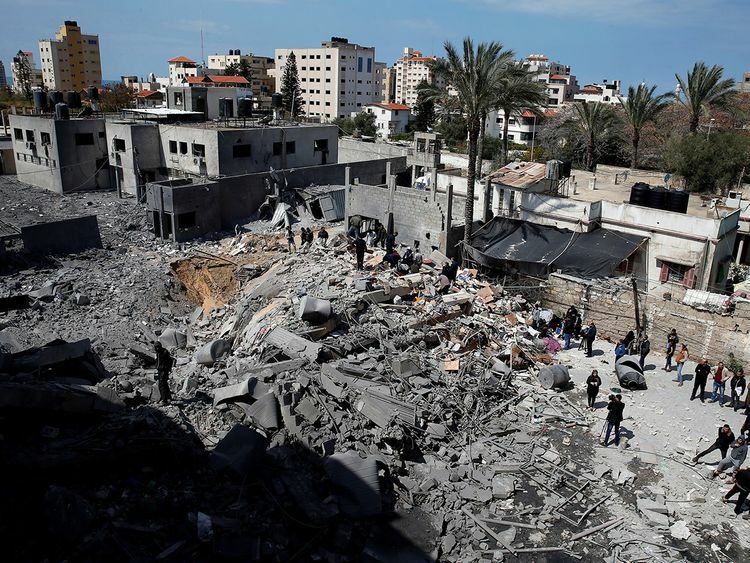 The Israeli bombardment was triggered by a surprise rocket fired early Monday from Gaza that slammed into a house in central Israel and wounded seven people. The Israeli occupation military said it was a self-manufactured rocket with a range of 120km, making it one of the deepest strikes ever carried out by Hamas. Hamas announced later in the day that Egyptian mediators had brokered a cease-fire but the firing continued overnight before calm appeared to return early Tuesday. Two weeks ago, rockets were fired from Gaza towards Israel’s densely populated commercial capital of Tel Aviv, and the Israeli regime struck back. Hamas said the rocket was fired accidentally and the fighting quickly subsided. Israel has launched three devastating wars on Gaza in the past decade. Although neither side appears to have an interest in another war, fighting could easily spin out of control. The 2014 Israeli war lasted 50 days and ended with over 2,000 Palestinian deaths, including hundreds of civilians, and 73 killed on the Israeli side. In Gaza, Hamas is facing perhaps its toughest domestic test since seizing control of the coastal territory from the rival Palestinian National Authority 12 years ago. An Israel-Egyptian blockade, imposed to weaken Hamas, combined with sanctions by the PNA and mismanagement by the Hamas government, have all fuelled an economic crisis that has left Gaza with an unemployment rate above 50 percent. Hamas has been leading weekly protests along the Israeli border for the past year in hopes of easing the blockade, but the demonstrations, during which the occupation regime shot dead more than 200 Palestinians, have done little to improve conditions. By limiting its fire to border communities after Monday’s long-range launch, Hamas seems to be trying to keep the conflagration on low intensity.